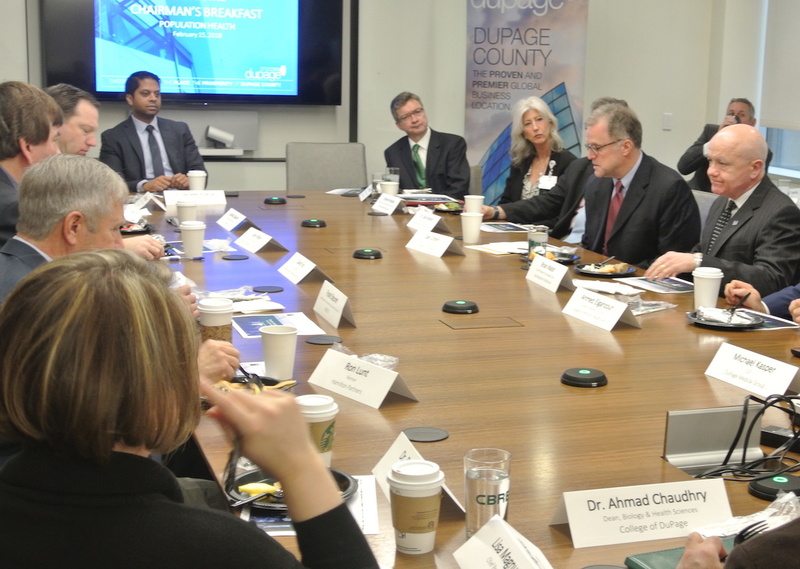 Leaders in healthcare and human resources gathered on Thursday, February 15 at a breakfast hosted by Choose DuPage and DuPage County Board Chairman, Dan Cronin to discuss ‘Population Health & Improving Healthcare Performance’ in DuPage County. Major DuPage County providers including Advocate Good Samaritan Hospital, American Academy of Pediatrics, Amita Health, DuPage Medical Group, Edward-Elmhurst Healthcare, Northwestern Medicine, and SHIFT. Human Resource directors and executives from area businesses including Greco & Sons, Hamilton Partners, Molex, and PNC Bank. DuPage’s higher education community including College of DuPage and Midwestern University. David Rubadue, National Director of Healthcare Actuarial Services at CBIZ started the breakfast with a presentation on ‘population health’. Rubadue defined population health management from an analytical perspective as a process involving three major steps: (1) aggregating patient data across multiple health information technology sources, (2) analyzing that data into a single actionable patient record, and (3) executing on programs and other efforts to allow care providers to improve both clinical and financial outcomes. He described it from a public health perspective as the science and art of preventing disease, prolonging life, and promoting health through organized efforts and informed choices. Following the presentation was an open-table discussion on what employers and providers can do to support population health management, the role data and analytics play in identifying care gaps and managing population health, and the benchmarks and ROI from supporting these programs. With healthcare costs increasing by 7% each year, employers and government entities are looking for new and creative ways to control healthcare costs. Implementing programs that reward employees for taking care of their health, and financially rewarding providers for their performance in caring for members will lead to higher quality care, a healthier life, and lower costs. Employers can promote population health by creating a culture of wellness at their organization. This can include disease management programs, case management, and other wellness initiatives. The most successful programs provide incentives for employees, and/or focus on making it easier for employees to make healthy choices. Providers can promote population health by participating in Accountable Care Organizations (ACOs), providing coordinated care and risk management to patient groups. Measurement and data analytics are essential parts of good population health management. This information comes from several sources including benefit plan data, provider data, outcome data, patient services, and more. Although aggregating the data is cumbersome and challenging, it is necessary to achieve improved outcomes. As Greg Hinz reported in his February 25 column, “$8.5 billion O’Hare expansion deal about to land,” the city of Chicago is close to deal for a massive expansion of O’Hare International Airport. The new O’Hare deal includes a major step towards a providing passenger access from the west— the construction of a 10,000-space employee parking lot on O’Hare’s western edge is a start. 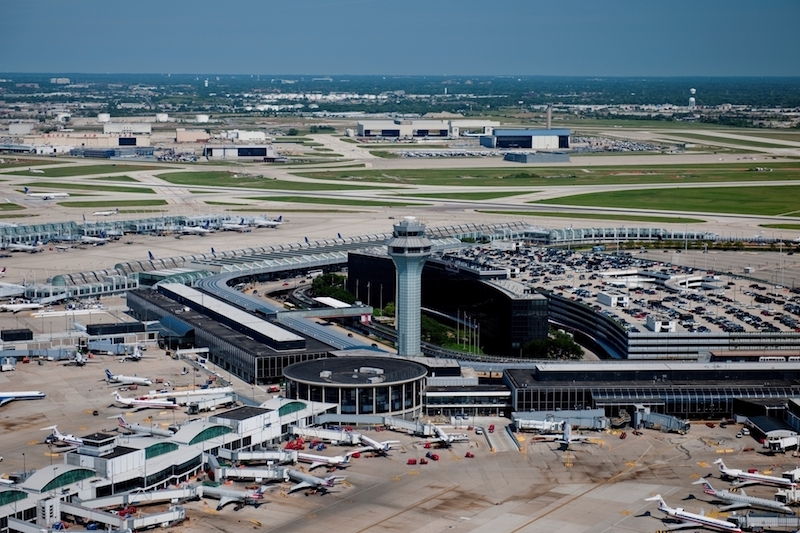 As anticipation builds for the announcement of a final deal, establishing a western access point to the airport must remain a critical component of the overall O’Hare Modernization Project (OMP). O’Hare International Airport is one of the world’s busiest airports, and hundreds of acres of ORD lay within DuPage County. While most appear to be focused on expanding gates and carriers, and possibly even developing a high speed express train to carry passengers back and forth from downtown, it’s important to remember the western access component of the larger OMP is critical to the overall success of the project; this effort will completely transform the economy of the entire Chicagoland region. There have been a number of stories written over the past few years regarding the progress of the Western Access O’Hare project, or rather, the lack of progress, due to continued gamesmanship by the City of Chicago. There is much at stake here. Many fail to realize the big picture impact of this incredibly important project, not only for DuPage County, but for residents and business across the Chicagoland region as whole – that means both the City as well as the surrounding suburbs. Mayor Emanuel has recently touted O’Hare as the “best connected airport” serving one of the most diversified economies. For this to be true, the commitment to Western Access as outlined in the OMP needs to remain a priority in the final deal the City. This project is vital to the future of our region and will remain a priority for Choose DuPage until it is complete. John Carpenter serves as the President/CEO of the Choose DuPage Economic Development Alliance. We are dedicated to establishing DuPage County as a premier global business location by working to expand and diversify the DuPage County economy through actions that stimulate business investment in its communities and generate desirable job opportunities for its residents. The findings from Choose DuPage’s 2017 Annual Economic Indicators Report confirms DuPage County’s economy is stronger than ever. Data suggests DuPage County offers a business-friendly environment for a variety of industry sectors including healthcare and manufacturing. While the state and surrounding communities continue to navigate struggles with high taxes, pension challenges and a hostile business climate, the findings in Choose DuPage’s report reinforce DuPage County’s attractiveness for business development as well as quality of life. Closing out the year, DuPage County had the lowest unemployment rate in the Chicagoland six-county region at 3.8%, lower than both the State of Illinois (4.7%) and United States (3.9%). DuPage County’s top job opportunities were reported to be in the computer and mathematical fields, office and administrative support, management, healthcare, sales, business and financial operations. Office vacancy rates dropped from 17.2% at the end of 2016 to 15.8% at the end of 2017; Industrial vacancy rates dropped from 5.3% this time last year, to 5.1%. DuPage County continues to have one of the lowest industrial vacancy rates in the region. DuPage County saw a number of large real estate transactions over the past year spurring job creation including AMITA Health’s relocation of its headquarters to Lisle in the fall of 2017. CAMCRAFT and Get Fresh Produce brought just under 500 new jobs to the Bartlett area, while Oak Brook gained more than 325 jobs via transactions by CBRE, Rush University Medical Center and others. 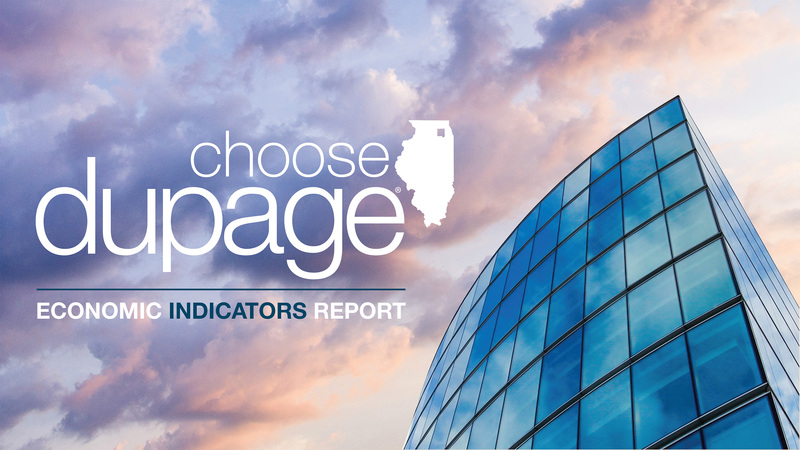 Details surrounding the top twenty real estate transactions of 2017, as well as an industry sector breakdown, are included in the Choose DuPage 2017 Annual Economic Indicators Report and can be viewed in its entirety by clicking here.